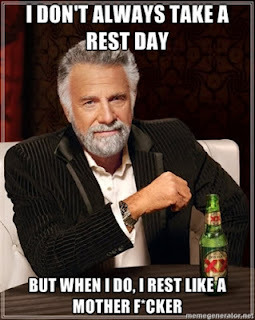 Sunday is a rest day for yours truly but I always find myself more restless than restful. I think that is the curse of CrossFit. You get addicted to the competition and adrenaline rush so it becomes difficult to actually relax and your days off. The trick is finding ways to stay active but not overdo it. Your body needs the recovery time that a rest day brings but laying around on the couch all day isn't good for you either. CrossFitters are notorious for overdoing it so with that in mind, here are some "do's" and "don'ts" for rest days. 5. Plan out your week: Rest day is the perfect time to plan out your meals for the week. You can use your "Non-WOD" time to prepare and package your food for the week which will prevent future cheating and save you tons of time later. Don't put this one off. Procrastination is like masturbation. It's a lot of fun until you realize you just f*cked yourself. Now go rest d*mn it!